Like this snack? Try our Dried Strawberries! Kiwi are originally from China and were referred to as "yang tao". Their current name comes from a New Zealand bird in hopes that it would make the fruit more appealing to consumers. Today kiwi fruit are grown and sold now all around the world. Dried kiwi is sweet and chewy and is one of the easier fruits to dry since it takes less time than many other fruits. RICH VITAMIN C SOURCE: Just one kiwi contains more vitamin C than three oranges. When the kiwi is dried there is an increase in the amount of vitamin C per gram than before the dehydration process. 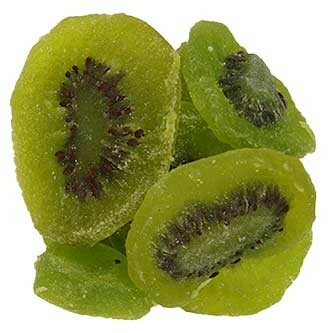 The nutrient database of the United States Department of Agriculture shows that one serving of kiwi per day will fulfill on 151% of the daily vitamin C requirement. Dried kiwi are popular with women because they can help reduce dark spots and improve water and oil balance in skin. TREAT CONSTIPATION: Dried kiwi is an excellent alternative to habit-forming laxatives. Multiple clinical studies find that regular consumption helps in achieving more frequent and more healthy bowel movements. It becomes difficult to break down food in the digestive system when the level of digestive bacteria drops. Consuming dried kiwi empowers the body to break down the food into nutrients that are readily absorbed. CALCIUM, IRON & POTASSIUM SOURCE: Dried kiwi increases the calcium and iron content in the body. The mineral iron enhances the generation of red blood cells in our bodies and strengthens bone density. One serving of kiwi also contains more potassium than what you would find in a banana. Potassium helps keep sodium levels and blood pressure low. TOP KITCHEN USES: Dried kiwi is sweet to snack on by itself. Like many dried fruits, it is a fabulous addition to salads and breakfast dishes both cold and hot. 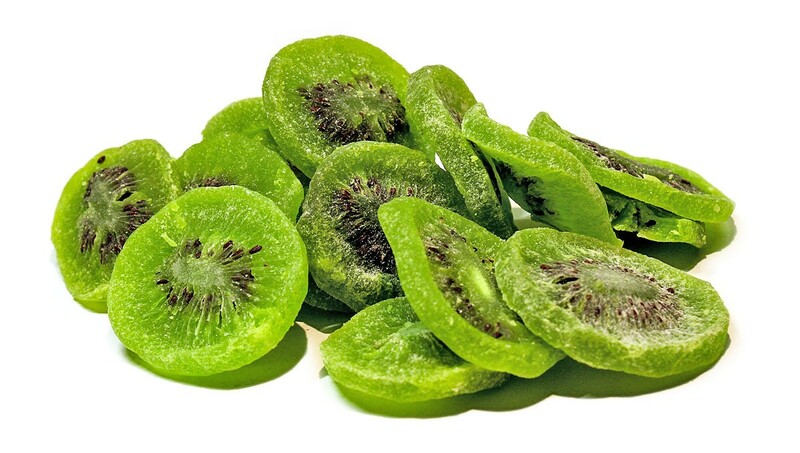 Dried kiwi is also a fantastic addition to baking goods like cakes, pastries and cookies. Kiwi, Sugar, Citric Acid, Sulfur Dioxide, Color Added: FD&C Blue #1 and Tartrazine FD&C Yellow #5. 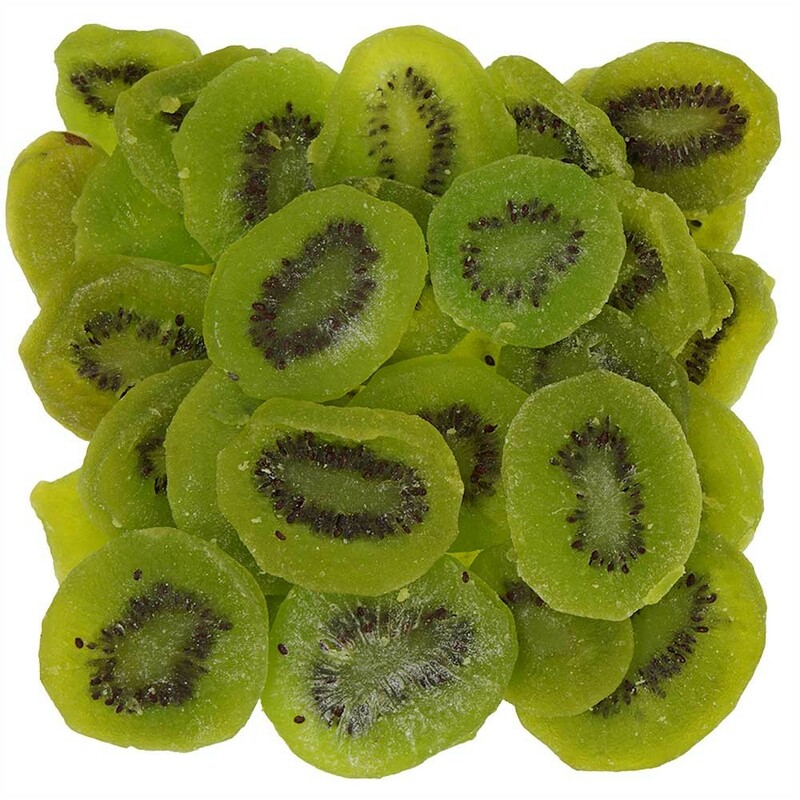 Buy Dried Kiwi In Bulk from eatnuts.com and save. Containing only about half a gram of fat these Dried Kiwi Slices from eatnuts.com are perfect for your low-fat snacking!